This project was created on 02/09/2019 and last updated 4 days ago. 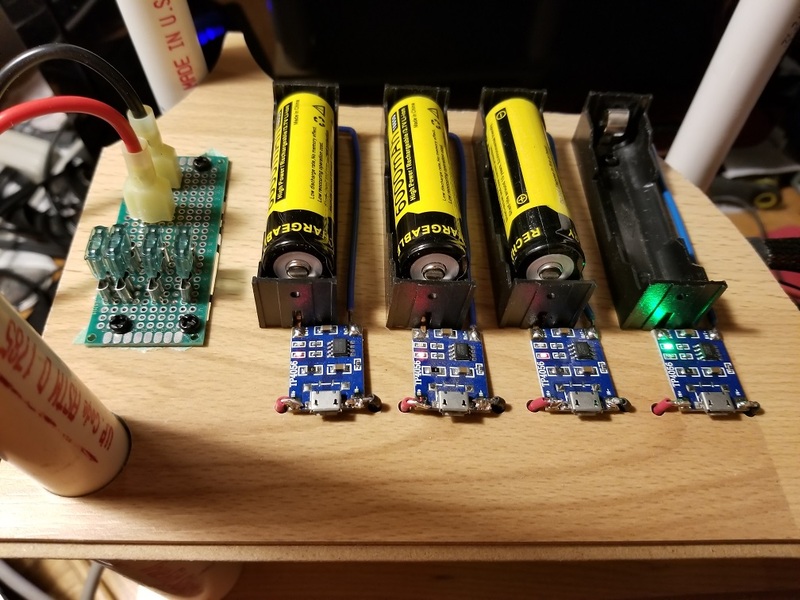 I have quite a few TP 4056 boards and single 18650 battery holders and for a some time have been trying to determine how I was going to build a recharging station and today the epiphany struck. I will be using this board in place of the mangled mess that I soldered up for the power distribution on the first try. Just a close up of the female spade terminals that fuses will be installed into, but since I had some overlap of the heat shrink tubing covering the opening, I had to trim some of it. 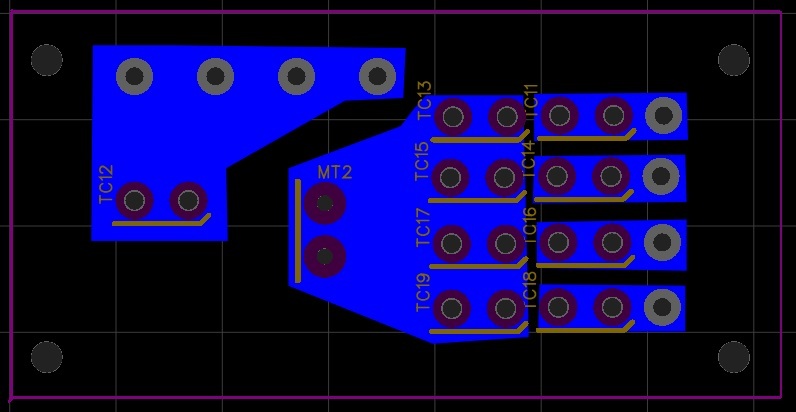 Spent a couple of hours a few days ago designing a new power distribution board to use on the charging tray. This way I can solder the wires to the through holes on the board instead of recreating the mangled mess like I did on the first charging tray. JCL has the boards and en-route as of this log entry. Just added some pictures to show how I prepped the power adapter board. OK, making some real progress. I have my first charging tray all set with the exception of actually adding the cell holders that have their TP-4056s soldered to them. I also have the other trays cut from their stock so I can start milling, drilling and trimming that will be needed to get those set to wire up to my ATX adapter board. I will also in about an hour from this post get a video summary of where I am at uploaded to you tube. The ATX Adapter boards I designed up in EasyEda and ordered through JCL showed up in the mail and seems I got the ATX 24 Pin vertical pin dimensioned correctly on the board. I do have the Gerber file in the files for this project for just the ATX connector. I did get everything soldered up except the male terminal connectors since I am still waiting for those to show up. Just hoping I got those mounting dimensions correct. There are pics of the everything soldered to the board (except the male terminals as mentioned) in the files. Added a few more pictures, to show some progress, I am expecting my ATX power adapter soon. I&apos;m just hoping I have the right dimensions for the PCB mountable spade terminals. After the several reworks and restarts I did today to get as far as I did I&apos;ll be needing more practice at that aspect of these projects as well. As you will see in the photos my solder skills have seriously depreciated in the past 20 some years, but this project should get that skill back in shape. What I did get done was to solder the wires that will go from the TP4056 boards to the power distribution board on the charging tray. So my attempt to mangle an old CPU power supply did not go well. not sure what I messed up or maybe the old power supply was bad to begin with. Any I spent the past week trying my hand at setting up (drawing up in both Express PCB and EasyEDA) an adapter board to simply connect the 20/24 pin CPU power supply cable to a board and setup some fused 5VDC connections. 5 volts is all I&apos;ll need for this project. I started with Express PCB liked what I had and even setup another adapter board to be able to use the other voltages on the 20/24 pin connector as well. The problem I ran into was finding on either Express PCB or EasyEDA was a ready made 20 pin PCB layout. The pins are not standard and during this time I come across someone else&apos;s adapter board for electronic bench power supply that is also fused and has a switch mounted on the board. 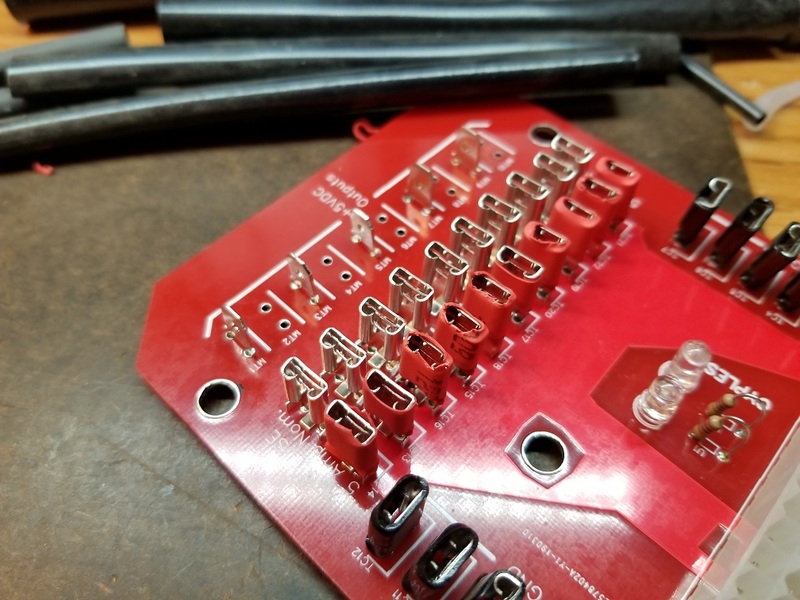 Really long story short the board I made in Express PCB which I was able to print I was able to see my layout for the power supply connector was no where near right. and I had a lot of difficulty getting to be right. I bought the power supply connectors from Spark fun and I had made the board before they showed up. 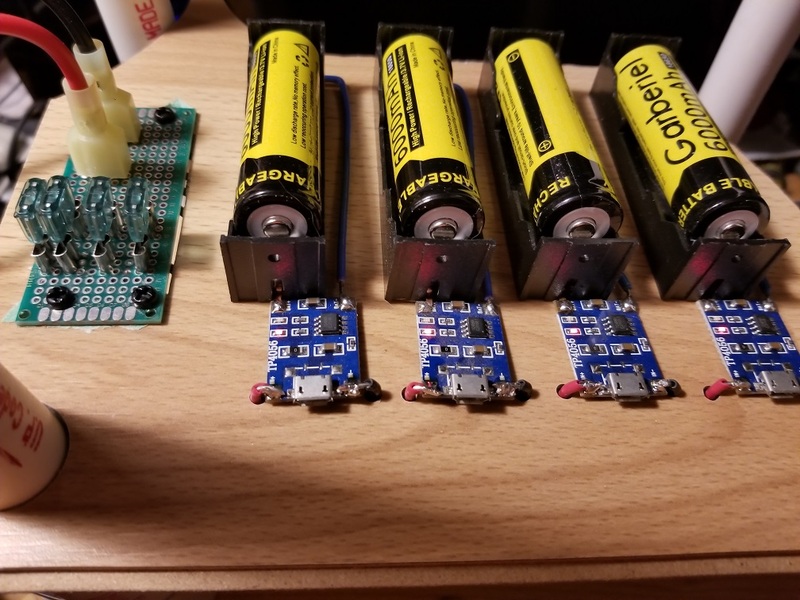 Needless to say I now have 5 boards ordered through EasyEDA and I hoping I designed the power connector correctly cause as I stated neither of these programs had ready made versions. I have added a screen shot of each board from both programs to the gallery. EasyEDa was by far the better price just under 40.00 USD for 5 boards where ExpressPCB would have wanted around 150.00 USD for 3 boards. I did select 2 oz copper since it is for power and I expect a few amps to be flowing through this board. I wasn&apos;t able to print in EasyEDA or at least I haven&apos;t figured it out how to yet. That would be nice to have/know to check the pin footprints on nonstandard pinouts. When I get the boards in a week or 2 and they are good I will share the gerber file for the EasyEDA version. I will wait to see how I did till then to create the power supply based on this same concept for my XYZ platform project that will need 5VDC and 12VDC. Been spending some time mangling a CPU power supply to provide the 5 Volts to supply the TP 4056s. Added a switch and an LED, waiting on 10 watt 5K resistors, found a source for $0.26 each only got 5 for now, hopefully be here fairly quickly since they are not on the transpacific boat. In the picture showing the top side of the Charging Tray, The board at the top of the pic needs to be reworked. It has fuses and fuse solder-able fuse connectors which I was going to use to connect the wries from this board to the TP 4056s. Since I changed my mind about how I am going to run the wires and embed them in the mdf like the bottom layer of a circuit board I can remove the connectors for the ground wires and I have to move the fuses to the side of the board where the pivot hole is located. Which means a complete new layout for this board. 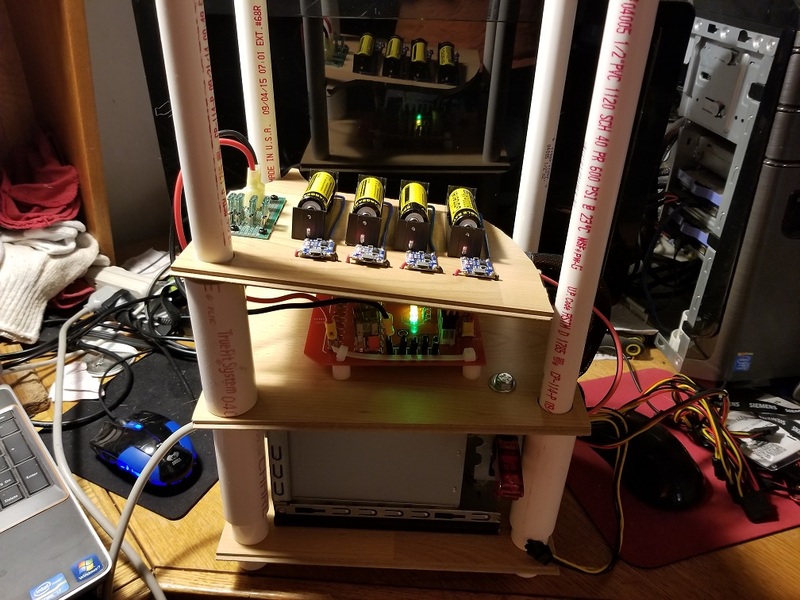 You are about to report the project "Multilayer Recharging 18650 Tower", please tell us the reason.